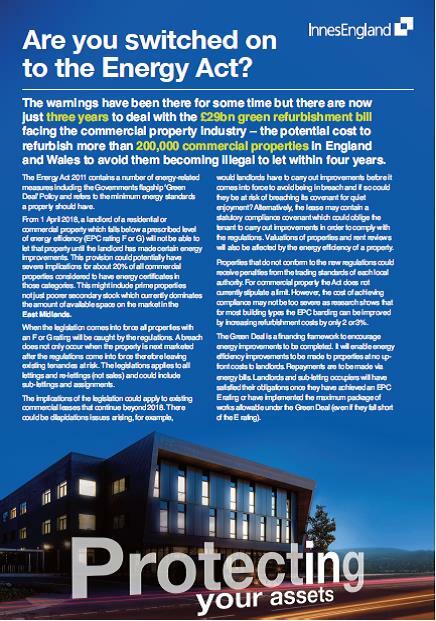 It’s now only three short years until the new energy efficiency regulations come into force when commercial properties will have to comply with new stringent legislation – at a potential cost of £29bn to the industry to refurbish 200,000 commercial properties across England and Wales. Innes England's energy expert Simon Dare explains. For those who are unfamiliar with the new legislation, from April 2018 it will be unlawful to let commercial properties with an EPC rating of F or G – that’s the lowest two grades of energy efficiency. After a considerable wait, the Department of Energy and Climate Change (DECC) published its response to a July 2014 consultation on the non-domestic private rented sector energy efficiency regulations for England and Wales and submitted the proposed regulations for parliamentary approval. As there is still uncertainty over how the proposals will work in practice, these regulations should help prompt firms to plan and implement its changes ahead of the policies coming into force. It is estimated around a fifth of non-domestic properties could be in the F and G rating brackets. Not only that but the new minimum standards could apply to all lettings and re-lettings, including sub-lettings and assignments. Valuations and rent reviews of properties could also be affected if their marketability is diminished. Implications for dilapidation liabilities at lease ends could also exist. Investment Property Forum research suggests that, for most building types, the EPC banding can be improved by increasing refurbishment costs by only 2 or 3%. Do you know the EPC rating on your building? If you don’t, you should find out. Utilise the time efficiently between now and 2018 to take advantage of void periods and undertake planned maintenance. The key here is preparation; property owners will put themselves under unnecessary pressure if they don’t plan well in advance of the new regulations.